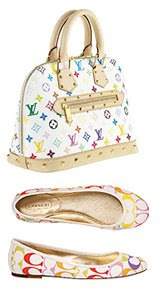 NY Spender: Should I match shoes with handbags? Should I match shoes with handbags? Dear NY Spender, I would like your opinion regarding shoes/handbag matching. I've bought a pair of blue flats, and I am not sure what color handbag I should wear with them. Can I wear a blue handbag or is that a fashion no-no? The answers to the question Should I match my shoes to my handbag? is: "Depends". 1) Yes you can match shoes and handbags. Some people consider this a bit dated, some other consider it a bit conservative, but I think that every case is different. For example, matching your black shoes to your black handbag will never be out-of-style, while matching your red and white shoes with your red and white handbag is sure to cause some loss of vision in innocent by-standers. In the case of your blue flats, I think it would be ok to try to find a blue handbag to match them, without getting the fashion police knocking at your door. Some people like to match designer items, like a Gucci bag with Gucci shoes, and I am not against it, as long as the logos are at a minimum. If you have too many logos going on, and you still want to wear them together, you can, as long as you understand the difference between too cute and too much. To wear this handbag with these flats, you would have to keep the rest of your outfit very quiet, and possibly very matching, like a black turtleneck and tight black jeans. When the logos are too loud (and when I say logos, I also mean patterns in general), then it's better not to match/pair them together, but wear them separately. 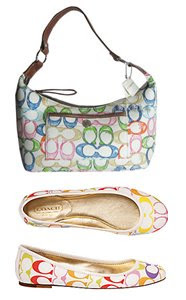 Even if you wore these Coach multicolored bag and shoes with an all white outfit, it would still look excessive, and tacky. And please, mix and match responsibly! This should never see the light of day! 2) No you shouldn't match shoes and handbags. A more modern approach is to coordinate without strictly matching. How this works is you match your shoes to your clothes and then you coordinate a bag to the whole outfit, and not just to the shoes. Your blue flats would look great with this look. 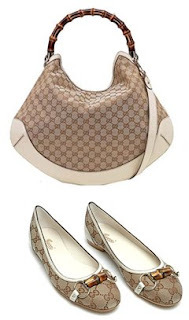 Your shoes and your handbag would be of two completely different colors, yet everything would look great together. You can try this not just with white, but with any other color that looks good with blue, like green or yellow or even purple. Of course, you will also have the choice of playing it safe and wear a black handbag, even if I am not too crazy about a blue/black combination. Hmmm, will have to think about this. I'm a "shoes/bag should match" type person. Well, a couple of years ago, I bought a great Coach bag in purple (plum? LOL) and I have yet to use it! Why? No purple shoes. It is a conundrum, let me tell you. I will have to see what kind of outfit I can pull together to incorporate the purple and a "shoe" color. Oh no, Plum! You have unused handbags in your closet??? That's one of my fashion capital sins! Now, you HAVE to wear this bag, and as soon as possible.